I saw "Tell Hector I Miss Him"
What I did beforehand: riding lesson where my instructor reminded me about the red failure signals I saw on the equine simulator, dropped the Bacon Provider’s shirts at the cleaners, bought bagels, went home, showered, got dressed, walked my dogs until they pooped and then took them straight home again, changed shoes, told 19 I was leaving. Realized I hadn’t checked the train schedule. Took off my shoes again. Set an alarm so I wouldn’t be late. Sat down and posted a blog post. Drove to train station listening to the random song Apple Music picked for me, which was Simon & Garfunkle’s “The Only Living Boy in New York,” which I tried to sing along to but kind of sucked at. Got a call from one of the organizers of the auction we attended on Sunday about the week in a Miami condo I bid on and won. Rode the train. Got out at Grand Central. Took the shuttle to Times Square where I planned to take the 1. In the middle of the crowded station there were two, slim bespectacled guys with guitars and stylish, short-brimmed straw hats setting up. They had an amp. Their expressions were attentive, like they were waiting for something. Then they began to play. I paused; subway musicians are one of the things I actually like about NYC. A white guy in a knitted balaclava said something to me. I couldn’t hear him. I leaned in. I did not want to yell. I simply touched his arm in an effort to express my understanding and left him. As I descended the stairs to the platform I could still hear him, shouting at the musicians. This is what’s happening now: angry white guys are showing up and shouting that what’s happening is fake. 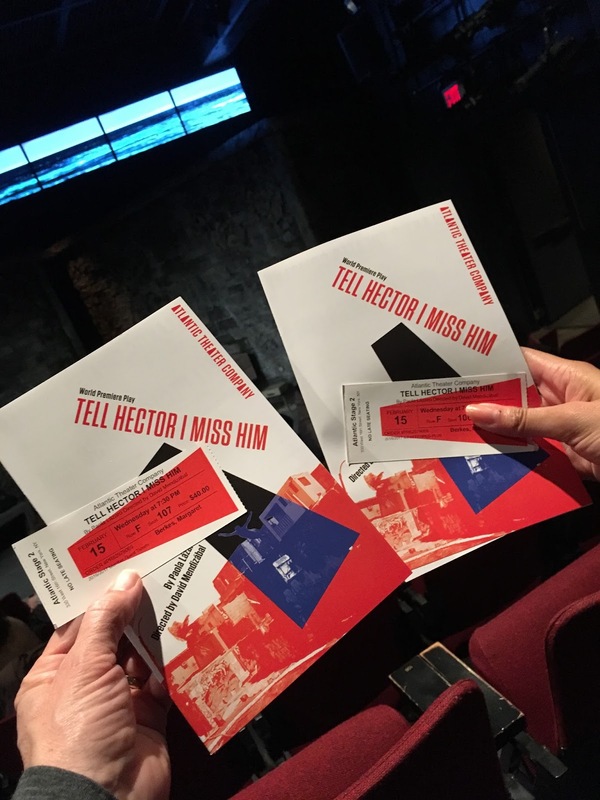 Who went with me: my niece, A., who came in to the city from Connecticut. How I got tickets: many months ago, I booked tickets to this show but changes of plans made it necessary to trade them. As a subscriber to this theater, I have the ability to change what are usually non-refundable tickets. Why I saw this show: subscribed to the season. Things that were sad: this play is about some terribly lonely people. Things that were funny: eager adulterers, an eager teen, an eager young lesbian, eager drug abuse. Things that were not funny: I don’t understand enough Spanish to understand more than the most fundamental cuss words. 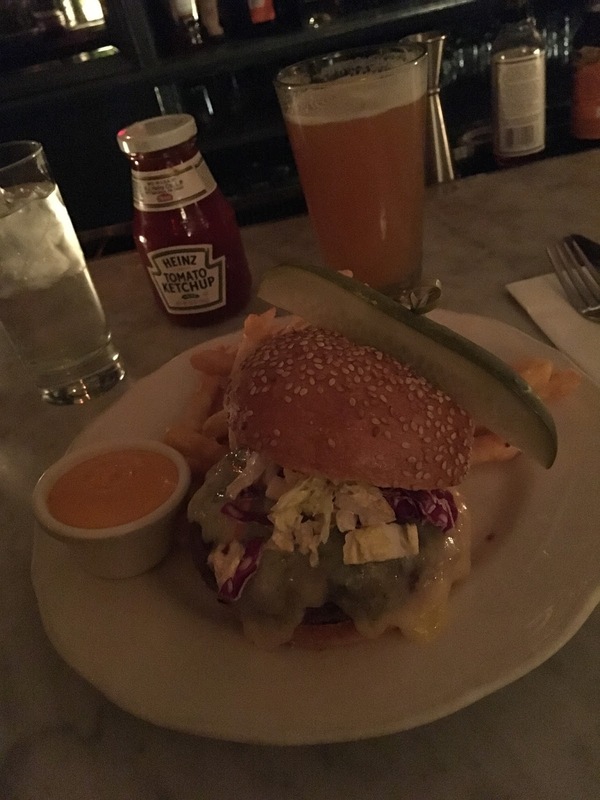 Something I ate: a burger and fries at the Tipsy Parson, on 9th Avenue a few blocks other of the theater. What it is: a fine play on a small stage with a big cast of talented actors. Who should see it: fans of “Orange is the New Black,” people who know all the Puerto Rican cuss words, people who want to know all the Puerto Rican cuss words. What I saw on the way home: I got to my train before the doors opened, but once the doors opened I got on board and walked past the seats facing the right way and for whatever reason sat down facing the wrong way. 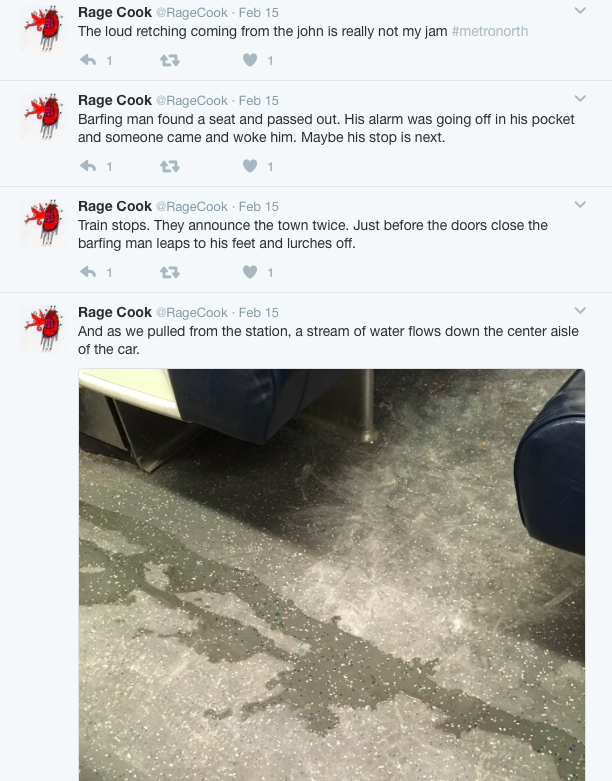 But I didn’t even find this out until the train started moving and most of the seats had someone sitting there so I had to choose between sitting down with someone who’d be getting up before me or might try to talk to me about fake news or something, or staying put in my own row. The other error I made was sitting too close to the bathroom. Really, you just don’t even want to sit in the car with the bathroom. I should have moved. But I didn’t move. I didn’t move because I would have had to choose between the other tired people, and most of them were men, and you know that one guy? He is out there. That one guy who thinks that because you’ve sat down next to him, you’ve chosen him. He’s won you over. It’s like you’ve accepted a drink from him at the bar, and now he’s going to talk to you. You’re going to get a piece of his mind. 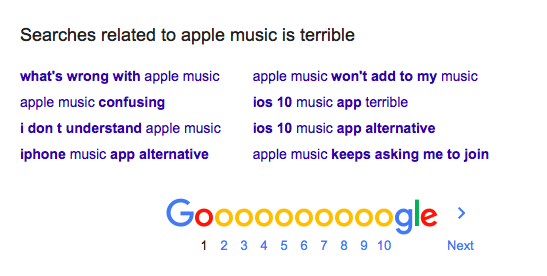 Or, worse. No. I did not want to sit accidentally with that one guy. I didn’t move. It was too late at night to move. Without a better alternative, the seat by the bathroom was better than joining that one guy with the wrong ideas. There was a parade of men using the bathroom, which was worth keeping an eye on in a furtive way. No eye-contact. Then some guy went in and was in there for a long time. Things quieted down. I forgot about the bathroom. I got absorbed in the pleasures offered by my iPhone But then there was the loud retching. Prolonged retching. Repeated retching. 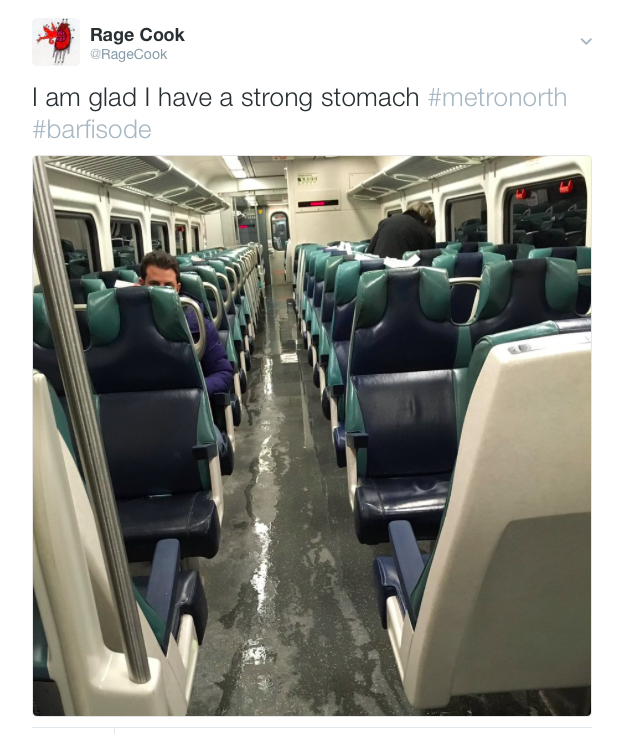 People went and got a conductor who was like, oh, yeah, there’s a guy in there barfing. Like that was the most normal thing that happens. A shaved-head guy in a suede jacket near me couldn’t take it anymore and moved to another car. Then suddenly the bathroom door opened and the barfing guy came out, sat down, and passed out. I could see his name and picture on his work ID, still clipped to his belt loop. Things got quiet again. As we neared White Plains the barfer’s phone alarm went off. A tall guy in a serious suit and overcoat stepped up to wake him. The barfer lurched to the door and disappeared into the winter night of White Plains. I lifted my feet from the floor of the train car, but I still did not move. I can’t say why. As we neared my stop, I tip-toed in my manure-proof, Chinese-made Australian paddock boots to the other end of the car. 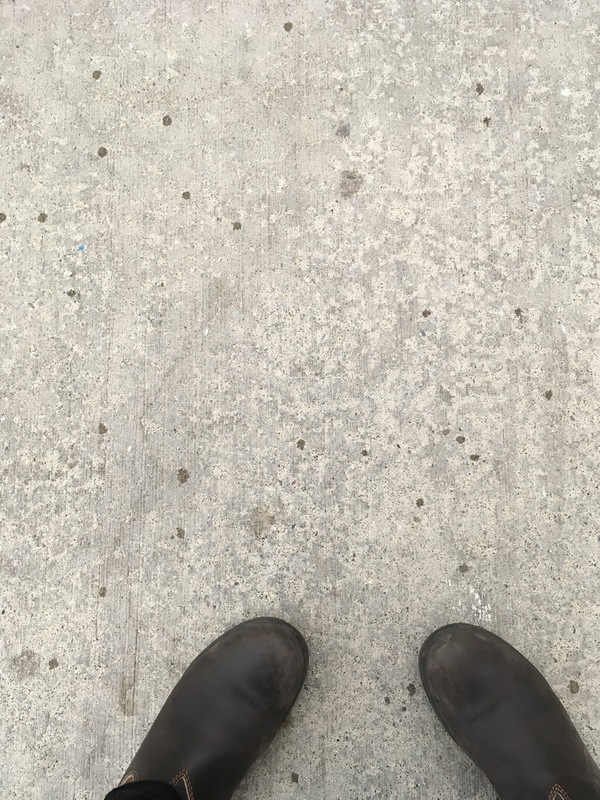 A tired man in an ironic working man’s knit cap and leather dress shoes stood at the edge of the puddle. I encouraged him to step back. Without acknowledging me, he was able to exit in two great long strides. I had to wade through it.